Every child wants their very own stool on which to sit! 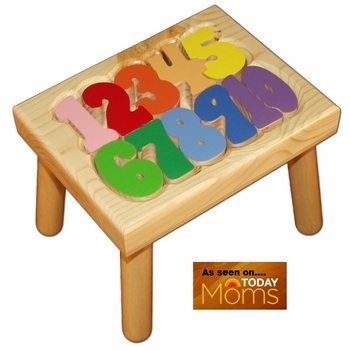 This educational gift helps babies learn problem solving and persistence as well as hand to eye coordination. Quality made in the USA of solid wood and then skillfully hand painted, this stool will last a lifetime! The top is 9 inches high and the dimensions are 9 x 12 inches. You can also choose to engrave birth information or your own personal message on bottom of stool for an added touch. Makes a great birthday gift too.